In Brief: A long hill climb takes us up on to a remote, rough, and seldom-visited stretch of unrestored Great Wall. Note: the climb back down takes us down a perpetually brushy section of trail, which may cause a bit of delay. The Great Wall crossing hills and mountains in Huailai District. 3–4 hours start to finish over 9km. Early start! We're leaving early to avoid the worst of the holiday traffic. We may still get stuck in a traffic jam at some point, and we recommend you don't make fixed plans for the evening. Bring a book or something to keep yourself entertained, just in case! On this hike we’ll head out to the border of Beijing Municipality and Hebei Province for a moderately difficult walk through peach orchards, up valleys, and along the Great Wall. The Great Wall out here is rough and seldom-visited—choose this hike if you're interested in a visit to a section of wall very different to what you've seen on postcards. In the Ming Dynasty, Zhenbiancheng was one of three important outposts on the border, along with Changyucheng and Baiyanggou. Modern Zhenbiancheng has grown in and around the old city walls. Much of the town walls still remain, as well as archways, bricks, and stone carvings. In more recent times, the area was the site of a major battle between the Chinese and Japanese armies, and it’s said that bullet holes can be seen in some of the walls. We'll follow an access road that begins near the village, and then up a leafy valley, passing through peach orchards before following a hill trail up to the Great Wall. For the first part of the valley we’ll be on a fairly flat trail, with views of the distinctive peaks of nearby ‘Brush-rest’ Mountain. From the head of the valley we’ll walk a hill trail that is moderately steep, arriving at a ruined tower on the Great Wall after 40-60 minutes of steady ascent. After a quick rest, we’ll continue along the wall, heading for another ruined tower that will be our lunch spot. The Great Wall in this area is not all in good condition, so for some of the hike we will need to walk alongside it. After lunch, our hike continues on the wall, until we reach the the point where we’ll head down a valley. The trail down the valley is steep to begin with, but eventually it flattens out and leads us through grassy fallow fields on the way back to the roadside. The first part of the trail down from the wall is seldom used and could be quite bushy. A large part of the hike is spent on trails up to and down from the wall. The actual walk on the wall itself is just over 2km in distance. The trail down from the wall is unmaintained, with sections that are brushy and steep. We recommend you wear trousers on this hike to protect your legs. 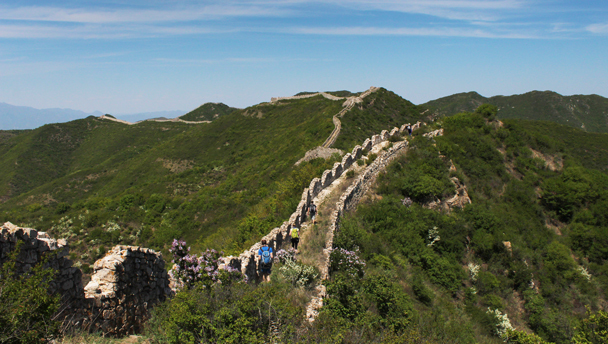 A hike on rough and rugged Great Wall in the northwest of Beijing—see a set of 31 photos. Fifteen photos of a late-winter hike at the old and rough Zhenbiancheng Great Wall. Photos of rough and rugged Great Wall under a beautiful ‘APEC blue’ sky. Out in the far west of Beijing is the Zhenbiancheng Great Wall, a stretch of unrestored Ming Dynasty-era wall. We saw a lot of beautiful autumn colours on this visit – click through to see the photos. Click through to see stats and photos from our Zhenbiancheng Great Wall hike - mountains, valleys, Great Wall, and an old walled town.